The Legacy of Living Root Bridges of Meghalaya ~ The Wandering Soul's Wander Tales.. The first step I put on a living root bridge felt surreal. I was walking on something that spanned generations and was born out of a clever marriage between bountiful nature and intelligent human foresight. Two strong Ficus trees provided the roots, the support and foundation on either end of the stream. Over the years they met halfway and continued to grow into each other. Thick strong roots formed the base while the smaller vines grew into a protective railing by the side of the bridge to provide safe crossing over raging streams or smaller brooks. This has been by far, the most interesting bridge I ever crossed. Earlier that day my heart skipped a beat when I was looking down at a vertigo inducing, near vertical stairs that led to Nongriat village that was on the other side of the valley. From my vantage point at Tyrna, village from where the hike starts, I could see the densely forested mountains surrounding me were devoid of any scars of civilization on their slopes. Instead, several gorgeous waterfalls lined the sheer rock faces at the top of the mountains. It felt wild and pristine. The loud roar of cascading waterfalls and rumbling streams was reverberating in the valley. A yellow butterfly fluttered around me, as I stood there transfixed taking in the view and the cool breeze. We were there to visit the famous double decker living root bridge of Nongriat. I took a deep breath and carefully trudged along the narrow stairs. While I was excited about the prospect of going down to the village, the daunting task of coming back up on this steep slope never left my mind. Every step I took down was only a haunting reminder of what I’ll have to climb on my way back up to Tyrna. Half an hour into the descent, we came across a village and a handwritten signboard that said “long root bridge”. Curious, we followed in that direction and to our astonishment we found another living root bridge that is claimed to be the longest living root bridge. At an approximate 30 meters, there is a very real possibility that this is the longest. The bridge was fairly new, rickety and was hanging high above the stream. The base was very uneven with wet trunks and stones stuck between the growing roots. But it looked magical nonetheless; we took turns to cross, as the bridge would wobble with every step. Red flowers were hanging from the roots and lavender blooms adorned the sides. I felt a strange exhilaration as I walked over the bridge, touched the moss, walked past the flowers and felt the fresh breeze that was coming from the mountains to my right. The stream below was singing its own tune and I felt so close to nature. Khasi districts of Meghalaya receive an ungodly amount of rain every monsoon as the moisture-laden winds from the Indian Ocean encounter their first obstruction, the mountains of Khasi hills. The clouds break into torrential downpour turning the gentle streams into raging torrents. Being the hilly area that it is, there are several stream crossings in between the villages. The bamboo bridges of early years wouldn’t hold up under the pressure of continuous moisture and sunshine-less days. They would rot and break every monsoon. Recognizing the need for a permanent and sustainable solution, the War-Khasis, a tribe in Meghalaya, looked for answers within their surroundings. A finest example of living architecture, these experts at cane craft guided the roots of Ficus Elastica through hollow beetelnut trunks to form the basic structure that supports the roots, as they grow strong over the years. A 100 years later, dozens of these living root bridges are stronger than ever and provide safe crossing to the villagers of the new generation irrespective of the season in the valleys of Khasi Hills. Once formed, they don’t need maintenance. The rains don’t rot the wood anymore. If anything, they only make the bridges look beautiful by aiding the growth of dense moss and blooming flowers that adorn the roots. After the unexpected encounter with the long living root bridge, we couldn’t wait to see the double decker bridge. We rushed but there were two more adventurous crossings over suspended and high-strung steel rope bridges spanning over much larger streams before we reached Nongriat. Nongriat is one of the many small villages situated in the valley near Cherrapunji and there are no roads to reach this village. A small settlement with about 30-40 households on the mountain slope, Nongriat seemed like a perfect place to escape and spend a few perfect days in nature’s lap. Two hours after we started, we reached the double decker bridge just after Nongriat village. It was a marvelous sight; the lower level was about 180 years old while the upper level was 80 years old. Keen on maintaining their unique status, a third level is being grown just above the second level by the villagers. The next morning, we went on a tiring but beautiful hike to a huge, roaring waterfall popularly known as Rainbow Waterfall. We stopped at streams on the way, waded through bushy jungle trails and waited patiently by the waterfall to see the rainbow. The sun was in no mood to shine as we sat getting drenched in the mist that rose from the volume of water tumbling down. Pink flowers swayed with the wind as dark clouds created drama in the sky. After returning from the hike, the boys chose the waterfall to the left of the guesthouse to take a bath and I went to another waterfall on the right, my own private bath in the midst of nature. As I bathed, sunlight was streaking through the canopy, butterflies were busy fluttering all around and a huge red caterpillar was munching on a leaf close by. All the noise of the discordant thoughts in my mind drowned in the ubiquitous sound of flowing water. There’s an abundance of natural beauty and tranquility in this village. Nothing about Nongriat feels remote. It feels right, like this was how we were supposed to live and rejoice in nature’s company - a whimsical place where childhood dreams full of magical mountains, colorful butterflies and enchanting forests might have played out. Living in a place that can be accurately described as a green haven nestled between the mountains and in such perfect harmony with nature must be deeply fulfilling. No wonder Biron, a school teacher at Sohra (as Cherrapunji is locally known), chose to leave his job and settle in this little quaint village. He said there’s a peace and quiet in Nongriat that he couldn’t find elsewhere. Biron had moved to Nongriat after getting married. After marriage, the man moves to the woman’s house in Meghalaya. Khasis follow a matrilineal culture where inheritance of property and titles passes through the maternal line of descent. It is said that during the olden days due to the uncertainty of a warrior man’s life, rights were passed down to women to keep the property within the family in the unfortunate event that the man is killed. Over the next two days, we crossed the Mawsaw and Double Decker living root bridges several times on our way to waterfalls and the village. But when I crossed the double decker bridge the last time, I stood in silence and marveled at the resourcefulness of the Khasis. The ingenuity of the inspired solution and the selfless foresight of the Khasi elders awed me and inspired me yet left me in melancholy. I wished more of us could lead such thoughtful and harmonious lives in sync with the natural world around us. As I prepared to leave three days later, I was not sure what I would miss the most - the pitter patter of raindrops at night or the waterfall I could see from my room or the sound of screeching insects or the rising moon that slowly crept upon us. The climb back up to Tyrna wasn’t as exerting as I thought it’d be. While waited for the cab to take us back to Sohra, we sat watching the waterfalls and clouds as butterflies of many colors took turns in fluttering around us, as if they were all saying farewell. As a traveler, my time in a place might be fleeting. But the memories I take, they’ll last forever. 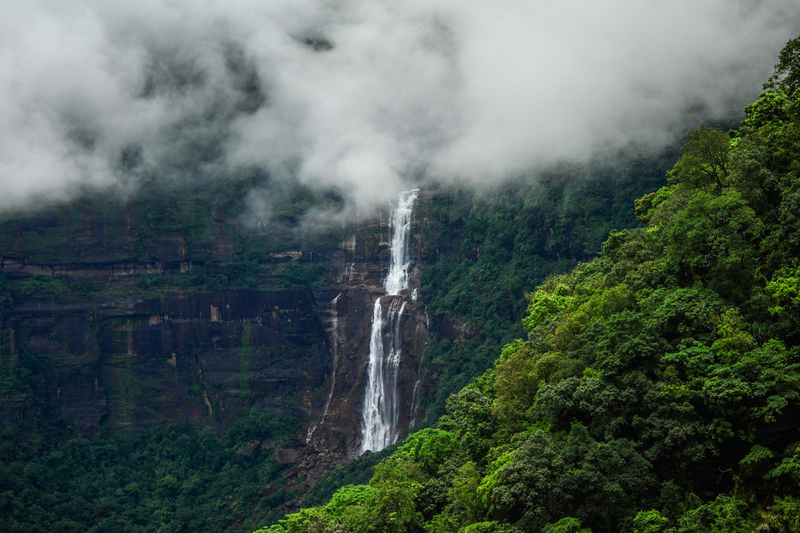 As I got into the cab, I didn’t bid goodbye to the mountains of Meghalaya, knowing we’d meet again in my dreams. An edited version of this story appeared in August 2014 issue of National Geographic Traveller India as "Living Legacy". Have been to Cherrapunji but unfortunately not able to see the root bridges. Wow, Neelima, reading about Living root bridges was very interesting. Would love to explore them for sure. Very informative and spectacular pics! Sister..... any news about results of ...CONTEST: Win 2 Himalayan Treks in India with GIO! The photos are stunning, Neelima! Lovely piece. Simply astonishing! The beauty of nature is clearly seen in the attractive pictures of the root bridges and the location. The description about the living root bridges was very intriguing. I enjoyed reading your blog and I wish that one day I can experience walking on this bridge. Been on my mind ever since I first read about them. Fascinating and bewitching. Thanks for sharing this! mesmerising pictures! which camera lens do you used?